On 19 January 2019, the 50th anniversary edition of the “boot” fair starts in Düsseldorf / Germany. Until 27 Jan, more than 2.000 exhibitors from almost 70 countries will present their products and services. 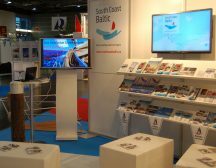 The SOUTH COAST BALTIC (SCB) Marketing Initiative will be present in Hall 14, Stand E35. 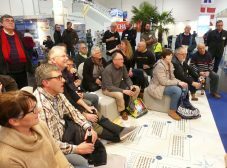 With lectures and cruise reports on the Travel World stage in Hall 13, many events on the booth and new materials tailored to the target groups, the sailors will be informed about the possibilities of boating along the southern shores of the Baltic Sea. The SCB Sailing Charter Brochure with tour suggestions, charter bases and charter companies along the southern Baltic coast, the 3rd, extended edition of the South Coast Baltic Harbour Guide, the SCB Motorboating Brochure “The most beautiful motorboat areas along the SOUTH COAST BALTIC” with descriptions of boating areas and route suggestions as well as the 2nd issue of the SOUTH COAST BALTIC Magazine will be presented.